Posted March 18th, 2019 by Matt Doll. As the consequences of climate change grow increasingly apparent in our communities, the issue has inspired an unprecedented level of climate activism by ordinary people demanding a safe and livable future. 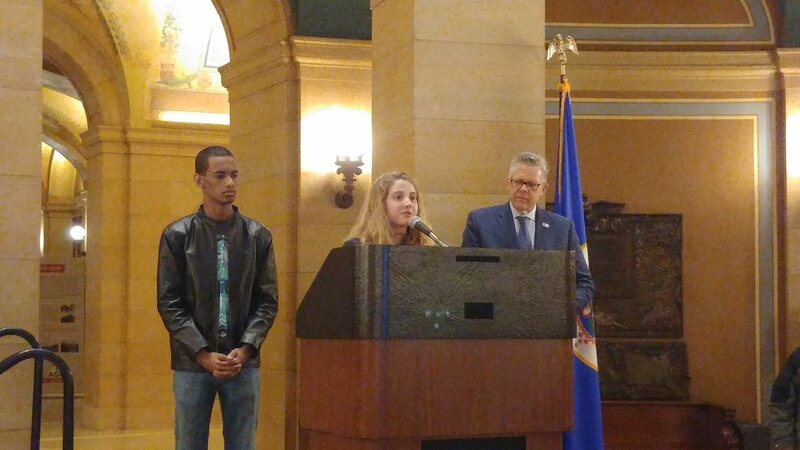 On Wednesday, more than 150 Minnesotans gathered at the State Capitol for Clean Energy and Climate Action Day organized by MEP and many partnering organizations. Clean our electricity generation, as much as possible, as fast as possible. Move everything else onto electricity: transportation, heating and industry sectors. Address agricultural emissions with the next generation of profitable crops that keep the land covered. Plant trees. Plant prairie. Sequester carbon. At a rally in the Minnesota State Capitol Rotunda, Representative Jean Wagenius, Chair of the House Energy and Climate Finance and Policy Division, said the most important thing you can do is reach out to everyone you know and ask them to contact their legislator with a short note that says they care about climate action and want to see progress now. Former state Senator Ellen Anderson, the principal author behind the first of its kind Next Generation Energy Act, signed in 2007 by Governor Tim Pawlenty, said, “In 2007, the stars aligned…the stars are aligning right now in 2019!” Anderson described how, despite previous opposition and skepticism, almost the entire legislature voted for the bill. Anna Grace Hottinger’s words were manifest across the globe on Friday, as hundreds of thousands of young people left classes to rally for ambitious and necessary action to confront the climate crisis. In India and South Africa, across Europe and on the steps of the Minnesota State Capitol, they gathered to demand that political leaders make providing a clean and livable future their top priority. This global Climate Strike continues in a year that has seen a groundswell of climate action and demands for a cleaner economy. The world is fortunate to have these youth taking leadership in the face of this challenge. And Minnesota is especially lucky to have so many people willing to unite with hope and ambition to confront climate change. The political leaders in Minnesota and across the country should take note: this is the time to come together, to aim higher, and to work harder than ever to protect our future.